It takes a lot to create a good brand. Big companies have an army of experts on their side, including brand specialists, graphic designers, marketing experts, copywriters, photographers... And if you're just launching your new business or creative venture, you're probably on a tight budget. Designers (myself included) insist that you should not be skimping on the quality of your presentation, but I understand that it's difficult to invest upfront in something that you aren't even sure will take off. So let's skip the preaching how you should absolutely let a professional do your branding and visual identity (it kind of goes without saying). I'll give you some tips on how to do your own branding if you can't afford to outsource everything right now. If your business or project becomes successful, you'll probably hire someone for a re-branding later on, because the DIY approach will cost you money in the long run. 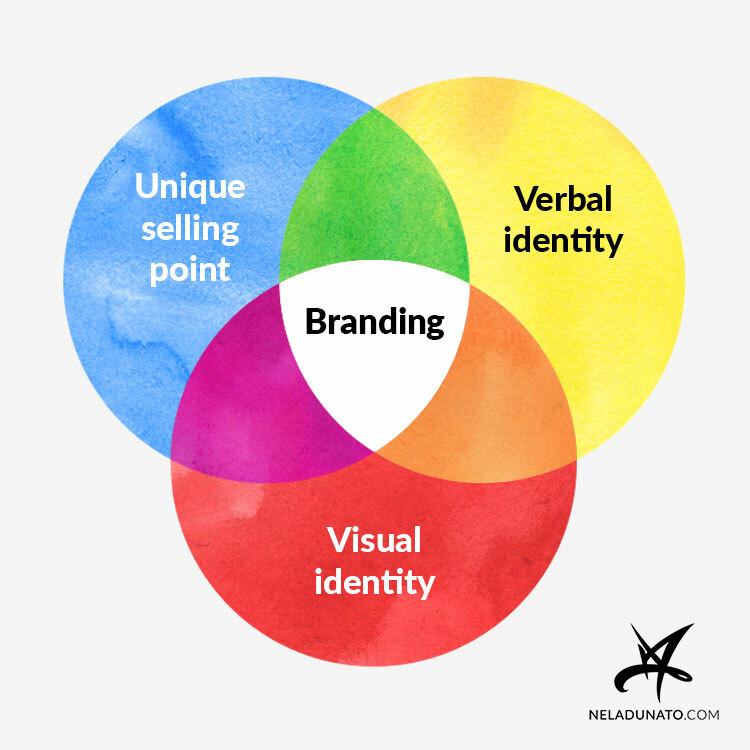 A Venn diagram of essential components of good branding. It will make sense by the end of this post. Sometimes it doesn't take strong visuals and shiny logos to make a brand. There are many bloggers and small businesses out there who rock at the written words so hard, they don't need no fancy visuals. A lot of my favorite websites started out with a pretty modest visual style, only to be rebranded years later, once they've had the traction and audience already. If you're not a great visual artist, don't rely too much on visuals when you're creating your own brand. Make what you do best the centerpiece of your branding. If you write well, just write — a lot. If you produce music, use your music (just please, don't let it auto-play in the background). If you're a visual artist, but not a graphic designer, let photos of your art & crafts dominate your promotional materials. In my Human Centered Brand approach, visual design is the very last step of the brand strategy – there's no point in picking colors and fonts before you have decided on the previous steps. The most important thing about branding is to keep it consistent across all the media: your website, printed materials, social networks, videos, and most importantly: in person presentation. On some of these venues you will use graphics, on others you will use mostly text, and when you talk to people in person or through video, your appearance, voice and personality will be the pillars of your brand experience. Whatever media you use, you want people to remember you and recognize you. If you're changing your branding all the time, each time a person stumbles into you, they will see someone new and won't make the connection with their previous interactions with you. Even if your design or copywriting are not done by a professional, it's better when it's consistent, than if you change your design or writing voice every time you post something on your blog or social media. Before working on your branding, you need to have all your whats, hows and whys clarified and written down. You can measure the effectiveness of your branding only if you have something to measure it against. Your branding doesn't exist in a vacuum, its purpose is to support your business and the communication with your clients (or fans). You need to learn everything you can about your business and your customers in order to make your branding strategy effective. If you’re not aware of your personal core values, it’s easy to wander off the path that leads to your personal and professional fulfillment. From my experience, our most rewarding personal and professional relationships happen between people who share common core values, so it's good to know what they are, and base your brand on them. I wrote how to identify your core values in detail here. In order to succeed, your business needs a unique value proposition, because if you aren't better than your competition at anything, your customers have no reason to buy from you. Think about what you do best, what problem you're solving that your competitors aren't, or what you're doing differently that makes you stand out in a positive light. Ideally your product or service is visibly unique and different from those your competitors make, but if it can't be made more unique, then you'll have to figure out what else you can highlight. Is your turnaround time really fast? Do you offer 24h/day phone support? Do you offer lifetime warranty on your creations? I suggest reading another article I wrote for in-depth help on how to write your unique value proposition. I'm sure you already know this, but it's so important I'll repeat it anyway. Before doing anything regarding your branding, you need to know who you're speaking to, and "everyone" is not the right answer. Think about who you want to work with, and who you don't want to work with. When you get clear on these things, everything else is easier. You'll know whose attention you want to attract, and you'll do everything for those people, and pretty much ignore what others think of you because they ain't buying anyway. 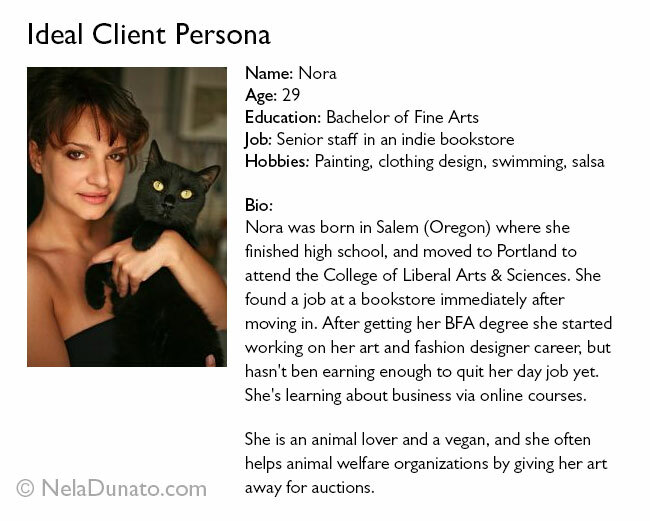 It helps if you make up a persona of such an ideal client and make her profile on a sheet of paper, together with a photo (scraped off the internet if you don't have your actual client photo) and post it on the wall of your office so you have her in mind every time you create any kind of content. What would your ideal client say to this? Don't be afraid to talk about this to yourself in your head (or out loud), it helps! Here's a silly example of a persona I just made up. Photo courtesy of Sxc.hu. Don't be afraid to stand out and show your unique self to the world. As a small business owner, this works in your favor, because people want to buy from you as a person. There may be others in your niche who offer more or less the same products or services, but you want to show that they're not the exact same products or services, that they're different because you're different. If you try to appeal to too many people, you will lose the opportunity to get true fans. Having a brand that targets everyone is like not having a brand at all – instead, use polarization to attract your right people. Do what flows naturally on your good days and on your bad days. Don't build a persona you won't be able to live up to. Being yourself is much, much easier. If you're a one-person business, this is pretty straightforward — the company's voice is your own voice. The voice is consistent throughout all your written and spoken materials, so after a while it becomes familiar to your customers. Tone depends on the occasion, and you'll want to use the tone that will either excite, calm, reassure, or cheer up your client, whatever their needs are at the given moment. If you're introducing them to your new offering, you'll want your client to feel excited and so you may sound really excited yourself, but if your client forgot to fill out a field in an order form, this is no place for excitement. Instead you'll have to use your sober, calm tone and politely inform your client of the error and how it may be fixed. Your personal voice will develop more as you write, that's why it's so helpful to write your blog very often. Not only can your blog get you more traffic, it is also a sandbox for your writing skills. After a while you'll get a lot better, and it will be much easier to write scary things such as sales pages and newsletters. Knowing what your branding is not is just as important as knowing what it is, and the former can point you to the latter in case you're stuck. 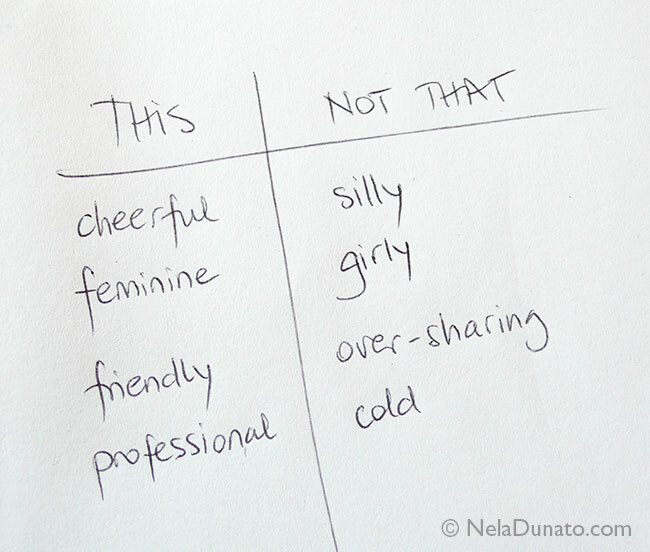 You can decide what your voice & tone (and everything else about your brand) is by using a "this, but not that" table. In the first column, you write what your brand is. In the second column, write an extreme version of that characteristic, something you want to stay away from (this also works for visual components of your brand!). Use this table whenever you have to check your writing for consistency. Read your text aloud and see if it fits within the parameters you've set in the table. You can also write sample snippets of text that you will use across your website and other materials in a document so you'll have it handy when you need it. How do you greet people? How do you invite them to take a look at your offerings? Think about those things and note them. You don't have to stick to this forever, of course. Rest assured you will tweak and revise everything as the time goes and your business grows. Logos aren't just decorative elements – a well designed logo can have real business benefits. I do not advise people to design their own logos since this is one of the most difficult design challenges that takes years of experience to do right. For a start, you can get by without one, until you can afford it. If you're set on creating your own logo, here are some tips I have for you. Unless you're a calligraphist, don't use your signature/handwriting as a logo. Your logo should be readable and recognizable from a distance, and in very small sizes. There are some fonts that are so overused in DIY logo design, I sincerely advise you not to use them. They're the default fonts in a lot of systems, that's why they're used so often, but with thousands of free fonts at your disposal (check out Font Squirrel for a really nice selection), there is no need to use the same tacky fonts as everyone else. Some of these fonts I suggest avoiding are: Comic Sans, Papyrus, Corsiva (also called Monotype Corsiva) and Times New Roman. Use only one font family. You can combine regular and bold typeface, but using more than one font family is reserved for people who know their typography. If you're not a designer, this is risky business. Your image doesn't remind people of something unpleasant (such as genitalia or any other unflattering imagery) — ask your friends for opinion, they'll tell you. I'm not joking about this! Whether you decide to align your symbol to the left side of your text, or centered above the text, apply this consistently — don't change symbol size and placement on every instance. If your business name is not self-explanatory, you may want to add a tagline. Make sure the tagline is short and to the point. For example, I have "Art & Design" beneath my name in my logo because my name by itself doesn't mean anything. If your business name already contains references to your services, you don't need a tagline. You can add one if you're really inspired to make one, but it better be good! Unless you're a professional copywriter or branding expert, lay off the smartypants slogans such as "Just do it" or something along those lines. If no one knows about you, your tagline should explain what you do. Your tagline can be incorporated in your logo if it's short enough, but you should also keep a tagline-free logo version. If a tagline is not a part of your logo, then just place it under the logo or to the right of the logo, with a bit of breathing space in between. Use the same font you used for the logo only in a smaller and thinner variant. Highlight your "calls to action". Calls to action are links such as "Order copywriting services", a "Buy Now" or "Subscribe to Newsletter" button, banners, or anything that encourages your visitors to take action immediately. Try to limit to only one call to action per page when possible. Don't put important things in drop-down menus — not everyone will look for them there. In fact, try to avoid drop-down menus altogether if you can, and structure your website in such a way that the user flow is logical. Think where you want your users to click first when they arrive at your website (hint: it's not a "Buy Now" button, they don't know you yet!). Then think how to get them from that first step to your desired action, which could very well be a "Buy Now" button. If you manage to get this right, you've done a lot more than your competitors who design their own websites. People are visual creatures, and when they arrive at your website or look at your brochure, they're looking for a point of interest. 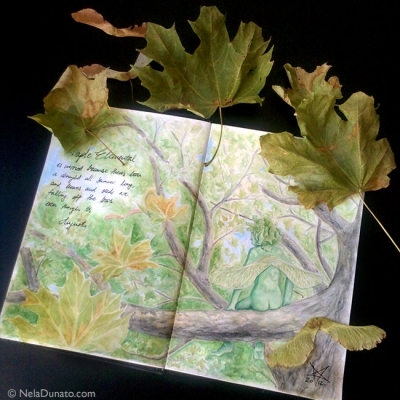 Photos and illustrations are a great way to get people's attention, and even evoke an emotional response. This is tricky, however. Too many stock photos of smiling business people can be counterproductive. There are two approaches you can take when selecting photos: literal and metaphorical. Literal approach implies you use photos connected to your industry. If you're a tech start-up, you'll use photos and illustrations related to technology in question. If you're a translator or a copywriter, you'll use photos of pens, papers & reading glasses or photos of pretty women with pens, papers and reading glasses. If you're going for the literal approach, it would be best if you could use your own photos of your actual product or service, if applicable. I know that some services are impossible to photograph. In that case you'll have to get really creative or just give up photos altogether. Metaphorical approach is finding imagery that corresponds to your brand name, tagline, or your mission. You can also look for photos that evoke the emotions your products and services offer to people, such as relaxation, confidence, safety, security, etc. Sometimes there will be people in these photos, sometimes there won't. When you're choosing a perfect image, go back to the "this, not that" table you've made earlier, and check if the photos match with what you've written there. It's extremely helpful to have one file you can refer to whenever you're creating something new. When you work with a professional designer, they will prepare a PDF file with the style guidelines that helps you implement the branding on your own. Depending on the scope of the work the designer or agency did, it may refer to the visuals only, or to the entire brand experience (you can see an example of such file I did that includes only visual components). This file can be a simple text document with some sample images, and you can add things to it and revise it as you go. Bonus, it will come in really handy when you decide to hire a professional designer! Sooner or later you may need to hire someone else to set up your website, answer your e-mails, write content etc. and in that case, it will be much easier to just provide them with this file instead of micro-managing their work, or accepting their work no matter how far from your branding it really is. I wrote a more detailed guide on branding guidelines if you want to learn what goes into them. Great branding won't do you any good if you don't adhere to it. I've seen companies where after spending months on creating a professional brand, implementing was very lax and in the end they haven't gotten the most from it. As a small business owner, you can control every piece of content that goes out into the world, so you can make sure that it fits within the guidelines you've set in place. Look at everything you make with critical eyes and see how well it fits in your branding. 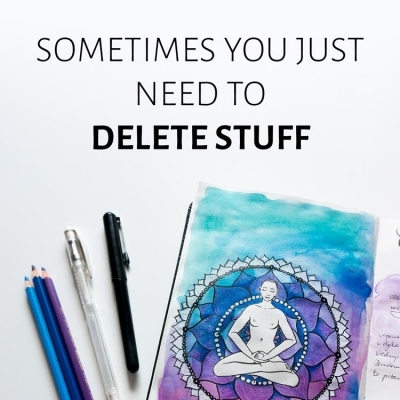 If it doesn't, revise, until this becomes so natural that you won't have to think about it anymore. 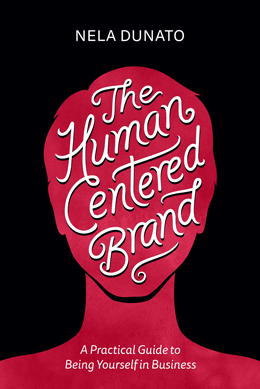 The Human Centered Brand helps you identify your core values, discover the unique value you offer to your clients, find your brand voice, determine who your ideal clients are, and design a visual brand that clearly communicates your message. Learn more about the book, and download the free bonus resources so you can get started today. How do you decide it's time for professional rebranding? Sooner or later there will come a day when you'll want your business to look more professional, so you can start charging premium prices for your work. Your income is stable and you expect to remain in business, and even grow. You want to raise your prices, but your current brand doesn't reflect premium prices. You're fed up with your current promotional materials. Your competitors look more appealing, and it's difficult for you to stand out. You've had issues with your printing service because the graphics you send them are either too small, or in an unusable format. You've started outsourcing some design work, but since your brand isn't complete, your promo materials don't have a unified and recognizable look. You're ready to invest in advertising to broaden your reach, but you're not sure your current branding is up to the task of converting these new visitors to clients. 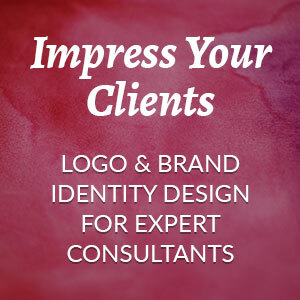 You recognized any of the 6 signs you need a new logo. If you've started noticing any of these, start budgeting for your re-brand and look around for designers who can do it for you (while you're at it, you can check out my services page). And remember – it's never to early to start looking for a designer. That way, when you decide to hire one, you'll be able to choose who you like best, instead of settling for someone who happened to be available at the time. Wow! What a thorough and great overview. This is so helpful for businesses just starting out. A lot of people think a brand is just a logo & business cards, great job showing that so much more goes into it. Yes, I really agree with Leah! 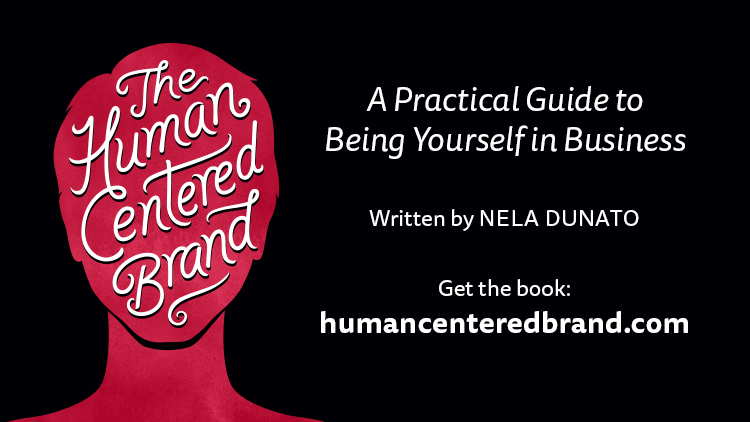 Fantastic high-value content, Nela and good examples to illustrate your points - some pieces I will really take to heart. I'm constantly thinking about my branding. Great points. Thanks! Thanks, everyone! I'm glad you enjoyed the post :) I tried to make it comprehensive, but hopefully not so much as to overload people with information. Love the "Highlight your quirks" and "This/Not that" - great ideas. Saw your post on Listapalooza. Great post! This is so nitty gritty, it's useful for someone at it awhile as a reminder and crucial for someone just beginning in business! I like comic sans once upon a time but have graduated from that. Use many different fonts for things. For my books I use palatino linotype because I think its easy to read. Any problems with that or suggestions for better? When you run into a wall like we all do sometimes, is there someone you admire who inspires you to climb the wall and go on? I did a post on my blog today about that. At http://www.cheatsheetstore.com Just scroll to bottom of page. That was so great I had to pin it! Through and with pictures. It a great primer and reminder when looking at branding for your business. Will have to do the This, not That exercise! That would help clarify some points for me for sure. Nela, this is insightful information and quite comprehensive. It's such good information, I've bookmarked it and will have to return and digest it a bit at a time. Thanks for the post. Great article about branding. I always say branding is later but I am so wrong, branding is now. I love these tips. Great post! I love the tips on ways to economize getting your brand started and ideas to keep in the fore front when branding. Definitely sharing this with my daughter, the budding artist, who needs to get out there. Excellent post on how to create a brand for a small business owner. I liked the "This/Not That" Activity. Great perspective and important to know. Great visuals, too! You break it down to super easy. Where were you when I was starting out? Wow, Nela - great post! You provided an excellent checklist for everyone to follow. I especially like your "This, Not That" chart idea ... so simple, yet handy for many aspects of brand-building and design. Sometimes the "not that" portion is even more telling than what the clients DO want. Palatino Linotype is fine, especially for books. I used it a few times as well. @Sarah: I'm so glad you found it helpful, thanks! 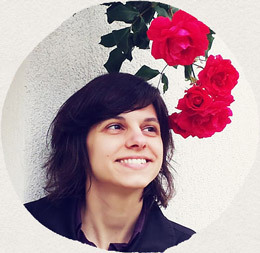 @Amelie: That's one very useful exercise everyone should do. In fact I might actually put it in my client questionnaires, I don't know why I didn't remember that already! @Henry, that's awesome, thank you! @Renae, thank you! That's wonderful, I hope your daughter will find it helpful! @Minette, thank you! Glad you liked it! @Marlys: Thank you! Yes, I agree - this exercise was helpful to me personally many times. Also the "Not that" is important for establishing boundaries and narrowing down your choices. You learn to see that you can't be everybody's everything, which is where a lot of business owners trip up.